There are many things that we can be unsure of in our lives. What career to pursue, which friends to have, who to spend the rest of our lives with, what outfit to wear, what to eat, should I have carried an umbrella today? There is one thing that I know with certainty, however. 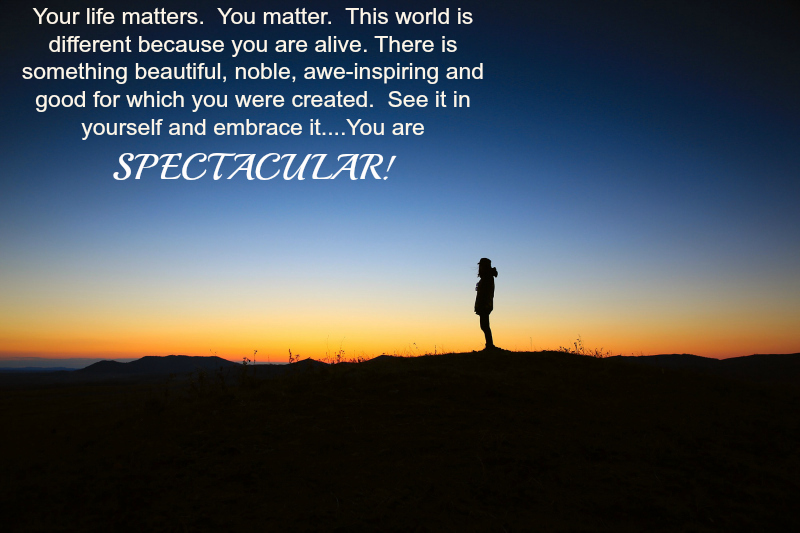 That is the fact that there is nothing ordinary about you. It does not matter under what circumstances you were born, or what your life has been like up to this point. You were created with a certain understanding, a certain vision, with particular tastes, with incredible creative ideas, with the capacity to love and to be loved, to be compassionate, with interesting quirks that are entirely your own, with a beauty and a uniqueness that can never be replicated by anyone else in this whole world. No matter who you are, the fact that you were born means that you have something incredible to contribute to this world, big or small. Your life matters. You matter. This world is different because you are alive. There is something beautiful, noble, awe-inspiring and good for which you were created. See it in yourself and embrace it. There is literally a fountain of potential waiting to explode in you. Unplug it and see what will happen in your life and the lives of others through you.